In My Father’s Eyes, is a 501 (c) 3 non-profit organization. We work with families of children who are battling cancer, or who have lost a child to cancer or other life threatening diseases. We partner with families who have children that have lost the battle or are currently fighting a life threatening disease. It is our goal to provide these heroic families with a lifetime of memories through an heirloom portrait. We want these kids and families to see how beautiful they are inside and out. Each portrait takes about 30 to 40 hours to complete – a labor of love that’s free of charge. Our goal is for these kids to look at their portrait and think, “ That is beautiful. I am beautiful!” Rather than focusing on the illness, we want to fill the kids with good memories. ‘ve always been an artist. It was simply a God given gift. A gift I never really did much with. I played around with it mostly. A few drawings here and there, a few paintings. Nothing serious. In 2012, I was in a very difficult place. I had been spending a lot of time asking God why I had this talent and what I was supposed to do with it. When He answered my prayer, it wasn’t at all what I wanted to hear. I felt God lay on my heart a purpose for my gift. I was being asked to use that gift to bless families of children battling cancer. Sadly, I ran from that calling for the next 3 years. Exhausted, I finally told my wife that I have to at least knock on that door. I have to at least be obedient, to try! I was scared to death, but history doesn’t remember those who were afraid, it remembers those who were afraid and did it anyway, those who took a big, giant, leap of faith! I called a local hospital, asked for the Child Life Department, and praise the Lord I got voice mail! I left a message and I really expected this was the end, but I did what I set out to do, I knocked! When the hospital called back, I was stunned. I explained what I wanted to do, and within a few days, they called to tell me they had visited with a family and would love to talk to me. I was shocked. It was in that moment this dream in my heart exploded… I went from someone who wanted nothing to do with this, to someone who can’t imagine my life without being able to bless these children and their families. To date, we have been honored to work with the families of 17 children in 11 states, coast to coast, and the island of Guam. God continues to open doors and I believe by working with other incredibly talented artist, we will be able to touch children and their families all over the world! 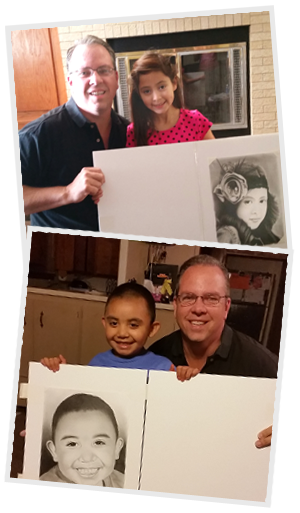 You can sponsor a portrait of child by donating to In My Father’s Eyes. Each portrait takes 30-40 hours to complete and with requests from families coming in almost weekly, your tax deductible donation helps us put a smile on more children and their families during a very difficult time.